Springhouse Country Park is delighted to offer our discerning customers the opportunity to enjoy our luxury 4 bedroom Cottage overlooking the Northumbrian hills. This secluded property is ideal for walkers and lovers of the great outdoors. Its also an ideal family retreat for enjoying those unforgettable family events such as Christmas and Easter. Imagine opening your Christmas Presents, around a roaring fire, far from the madding crowd. Stunning Country Cottage, set within the beautiful Nothumbrian countryside. 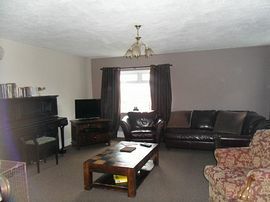 Consisting of two double bedrooms and two twin rooms. 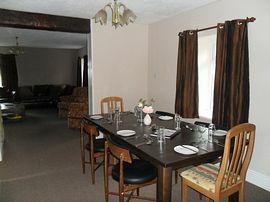 Spacious lounge fully equiped with a cosy log burning stove and breath taking views across the valley. 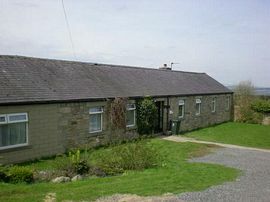 Fully equipped kitchen, inc microwave, electric stove,and washing machine. 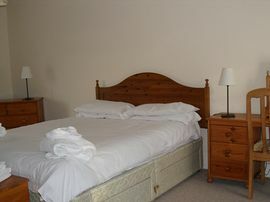 All bedding and towels are supplied. Please feel free to bring your pets along for a holiday too. 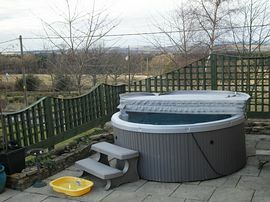 Large garden area with private patio and outdoor hot tub area. Local Services: Springhouse Country Park is excellently situated to utilise as a base for exploring the local area and discovering the incredible array of interesting and beautiful places to visit. We are only three miles away from Slaley Hall which provides one of the most scenic and challenging golf venues in the country. There are two championship courses on offer which have hosted an annual event on the european tour for several years. From the A1 towards Newcastle take junction 58 onto the A68 then turn at Kiln Pit Hill for Slaley, follow brown caravan symbols for Springhouse. Please note that all prices are subject to change.